Today we have more challenge blogs featuring Operation Write Home in honor of our birthday celebration! Here's a link to the Shelly's Images challenge blog so you can play along! Our next challenge blog is Some Odd Girl! Kristy has provided a freebie for OWH. Some Odd Girl is the place to find fun and quirky digis that I know you will love! Some Odd Girl was inspired by two great friends who are such dolls! They took one of my pencil drawings and made it into red rubber and that act of generosity spiraled into what you see today. I am a married FTWM of 2 who has a hubby who not only loves me but supports my crafting and my site as my IT guy. What more could a girl want? I am an artist born who started out with pencils then acrylics and now scrapbook and am a cardmaker. I design things that I love and hope you have as much fun with our stamps as we do! Join us on September 21 for the release of our new Tinies line and don't forget about our monthly freebies and SOG Points program. Our Challenge Blog has bi-weekly fun that hopefully will help inspire you to use your digis! Our sample was made by Kristy of Some Odd Girl, to see more of her wonderful creations you can visit her blog My Corner of the Studio. Here's a link to Some Odd Girl challenge blog so you can play along! I'd also like to introduce Paper Romance! Paper Romance is an online store that features a wide assortment of Rubber Stamps, Card making supplies & Wedding Stationery. They run a challenge blog with weekly prizes to one lucky random winner. 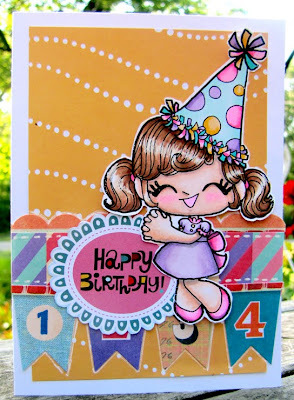 Visit www.PaperRomance.com today for all of your cardmaking needs! Special discount code for OWH card makers! Code: loveOWH Use in the shopping cart for 10% off your entire purchase! We also have a beautiful card made by Amy for your inspiraton. Here's a link to Paper Romance so you can play along in their challenge featuring Operation Write Home! And tomorrow night - Friday night! - 5pm PST/8pm EST, there will be a live chat on the Fiskateers chatroom! Check in here at that time for a link and instructions for log-in. SO happy to be participating in this wonderful cause! I have a package just about ready to go - just making sure I have envelopes for my cards, and have written Operation Write Home on the backs! I hope this shout-out brings in a TON of wonderful cards for our troops! :) You folks are doing such a nice thing! I will be participating in the Fiskateers card making effort this weekend. Lead Fiskateer Tami has been working to get us all organized and ready to go!